Porsche 911 Carrera GTS | What Car? Porsche has just taken the wraps off an 'exceptionally sporty' 911 Carrera, here at the Paris motor show. The new GTS combines the wider body of the four-wheel-drive Carrera 4 models with a lighter rear-wheel drive layout, and it packs even more power. Under the bonnet is an uprated, 402bhp version of the 3.8-litre six-cylinder engine fitted to other models which makes the GTS the most powerful Carrera model. Compared with the Carrera S, the GTS's extra 22bhp is enough to shave a tenth off the 0-62mph to 4.6 seconds time and boost the top speed by 2mph. Despite the extra power, the car returns 27.7mpg, which is slightly better than the Carrera S.
The GTS features a set of black 19-inch RS Spyder alloy wheels, a SportDesign front apron, special sideskirts and black exhaust pipes. An alcantara-trimmed cabin gives an even sportier feel. ?? Standard equipment includes a six-speed manual gearbox and a vehicle tracking system. 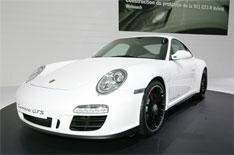 A twin-clutch, semi-automatic, seven-speed PDK 'box is among the options. The new model goes on sale in December, with prices starting at 76,758 for the Coupe and 83,493 for the Cabriolet.